Marty joins the other guests at Sam and Georgia's wedding, held at Georgia's home. Helen is the Maid Of Honor but has a hard time maintaining her composure during that passionate kiss. Then ... While the reception is in full swing Arnett shows up. He suspects Sam's involvement in the murder and needs evidence to back it up. 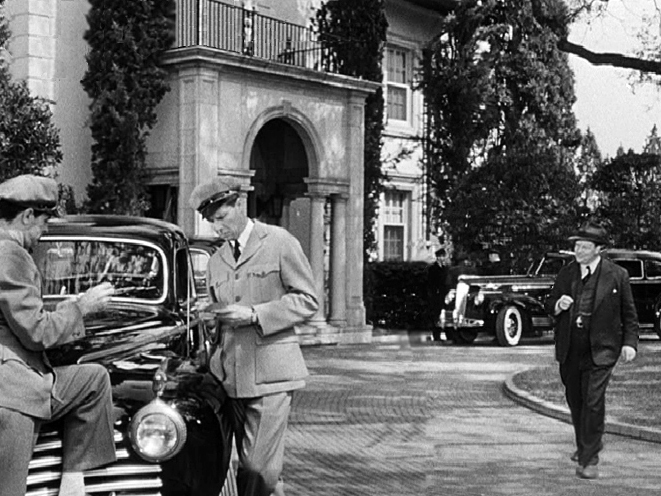 ... and Now, supposedly San Francisco but this was filmed in Southern California at the Villa Arden at 1145 Arden Road, Pasadena (map). 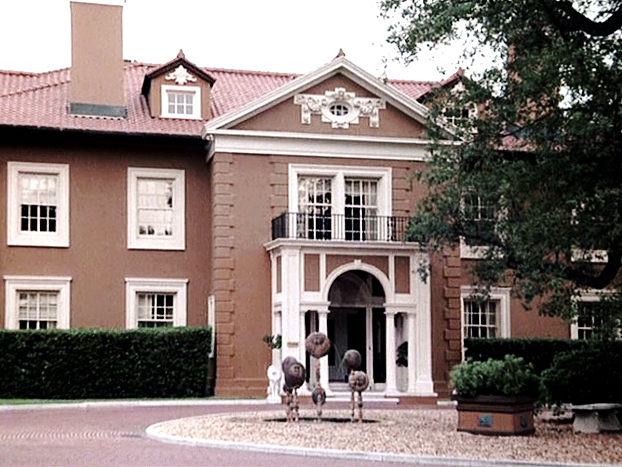 The house was also seen earlier in the movie. Then ... Arnett adopts his best hangdog expression and knocks on the door of the servant's quarters. His plan is to feign hunger, offer to work for a meal, and find out as much as he can from the staff. ... and Now, In this recent aerial view of the Villa Arden the arrow points to that side door. The housekeeper alerts Helen to the stranger asking lots of questions in the kitchen. When she demands to see his I.D. and finds out he is a private eye checking up on Sam the audience wonders how she will react. Will she tell her sister? Don't hold your breath for too long, it is a film noir after all.